The Client came to us with the goal of creating a sponsored event to showcase the very best of Rhode Island to 500 invitation-only VIP guests, out of the conference of over 1000 people. With the Client’s company headquarters being in Providence, she was instrumental in bringing her trade association’s annual conference to the city. Working with a total of four co-sponsors for this event, this was to be the grandest event of the conference, to outshine all other competing sponsor and conference events taking place, and also to allow our local Client, the biggest contributing sponsor, to shine within her state. What better setting for an authentic Rhode Island experience than dinner at the State House followed by a private late-night lounge overlooking Providence WaterFire. The group was shuttled seamlessly by trolley from various Providence hotels, coordinated by our expert Meet & Greet staff. Upon arrival to the State House, guests enjoyed touring the magnificent interior while sipping Prosecco paired with local-flavor hors d’oeuvres to the tune of a famed local harpist playing softly in the background. Guests were then led down a lantern-lit walk to the State House lawn where they were seated for dinner under a grand courtyard tent custom-designed with a natural, organic feel. Green sheers draped the tent sides and ceilings, birch trunks disguised the tent poles and a large custom bar was built in the open-air center courtyard. Boxwoods of moss with touches of jade roses, herbs and succulents accented by candlelight adorned the tables. 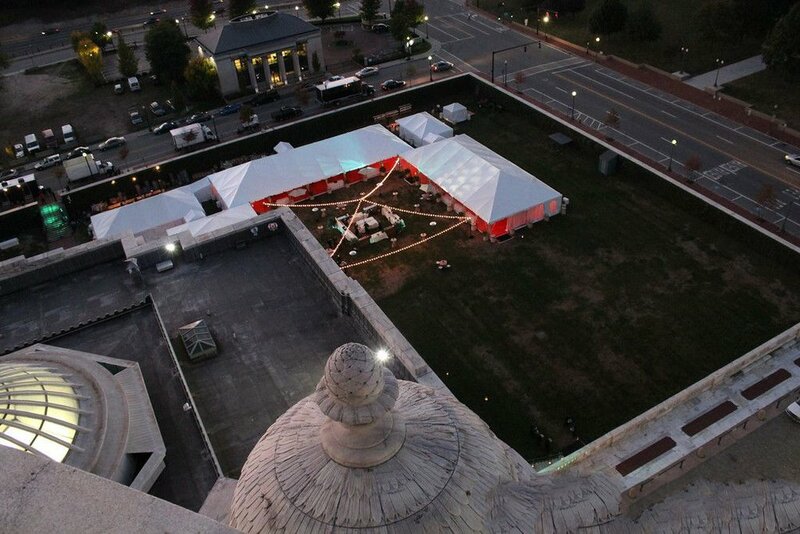 Gobos highlighted the tent and State House exterior. The unique dinner menu featured the freshest of local ingredients. After dinner, guests were led down to Waterplace Park by dignitaries holding blazing torches for a private WaterFire. The grand processional was a spectacle in itself… 500 people walked in unison across the State House grounds, through Station Park and down to Waterplace Park Basin where fire spinning performances wowed the group, Braziers were lit and hundreds of torches formed a ring of fire around the park. During the WaterFire performance, guests enjoyed libations and desserts while dancing the night away inside the unrecognizable Ruth’s Chris Steakhouse. The space was completely transformed from a restaurant into a custom night club setting with contemporary lounge groupings, glow bars on the patio and a specialty dance floor with an upbeat DJ. 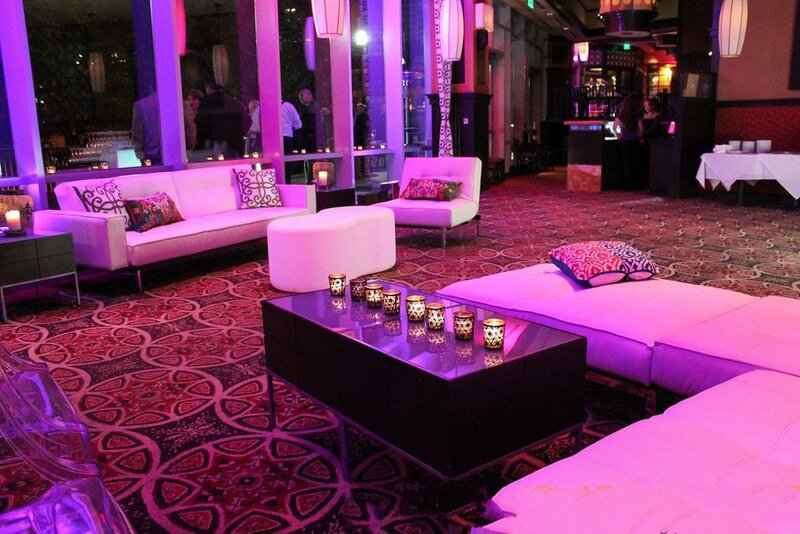 Warm tone accents, up-lighting and candles provided a mature, masculine club-like atmosphere within. “The best event in the conference history” was just one of the compliments our client received after the event. By utilizing our local resources and expertise in pre-planning and execution from behind the scenes, we were able to successfully accomplish the challenges set forth, allowing our Client to shine throughout the memorable event. From moving 500 people from various hotels, to adhering to a tight one hour timeline for dinner service and coordinating all necessary logistics such as street closures, permitting, tent restrictions, etc. 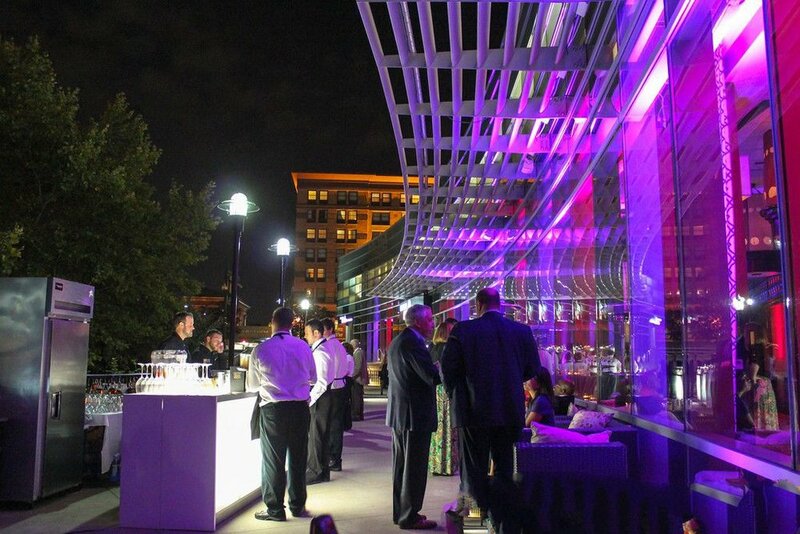 ~ Newport Hospitality proudly planned and executed this VIP event with complete success!